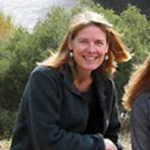 Susan Robinson is a grant writer for Save The Whales and several other organizations in the Monterey Bay area, and is currently coordinating the planning effort for the Greater Monterey County Integrated Regional Water Management Plan. Her passion for education, water policy, and protecting the environment comes through in her writing. Susan's other full-time job is music. She tours nationally as part of a folk and old time duo with her husband, Dana Robinson (www.robinsongs.com).